“If you can make it there, you can make it anywhere...” to paraphrase Old Blue Eyes, and China's government-owned Xinhua news agency has definitely made it – to the heart of Times Square! 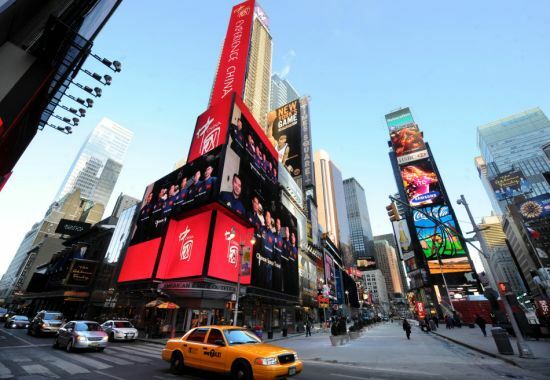 Xinhua (pronounced "Shin-wa") scored an impressive advertising coup by taking over the space on the LED billboard at 2 Times Square that had been leased by HSBC Bank for the last 10 years. When HSBC announced they weren't renewing their lease, Xinhua jumped at the chance to occupy the so-called “spectacular” which sits just beneath the blue Prudential sign at the tip of the stack. 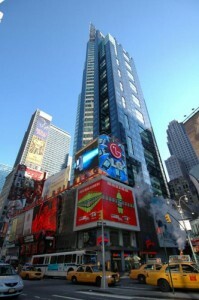 Seen in an artist's conception above, the Xinhua sign will debut on Monday, August 1st of 2011. The building at 2 Times Square anchors the northern end of the district and is instantly recognizable as a premier New York City landmark. 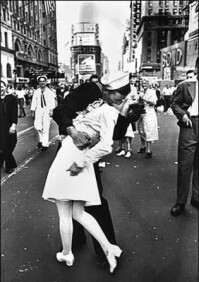 It enjoys a wealth of screen time during the annual New Years Eve broadcasts and can be seen in the background of countless photographs, including the famous shot of an American sailor and nurse kissing to celebrate VJ-Day in 1945. Xinhua's takeover of the premium 60ft by 40ft advertising space may come as a shock to many but to those who've had their eye on the broadcaster it comes as no surprise. Last January the Chinese government tested the waters by running a series of promotional commercials on 6 jumbo screens in Times Square. The ads, timed to coincide with Chinese president Hu Jintao's visit to the United States, featured well-known Chinese celebrities including former NBA star Yao Ming and concert pianist Lang Lang. Xinhua has been building up a solid footprint in the Big Apple for some time now. Last summer Xinhua rocked the city's real estate market by leasing the entire 44th floor of 1540 Broadway, a $355 million Times Square tower on 45th street (right). Xinhua plans to use the 18,600 square foot space for offices and television studios; programming produced at the location will be broadcast back to China. 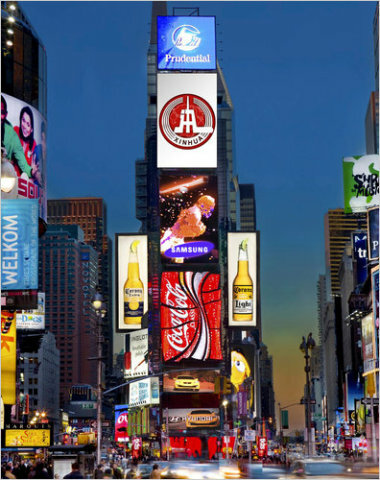 As for the Times Square “spectacular”, terms of the lease have not been disclosed but according to Brian Turner, president of Sherwood Outdoor, Xinhua will enjoy prime exposure for a term “in excess of six years.” It's a good thing Xinhua's owners (the Chinese government) have deep pockets: comparable ad space has been known to lease for up to $400,000 per month! Plan Z, TAX the TAX Man! See The Top Chair Designs From NYC’s Battery Park Contest!